It’s not likely that you’ll walk into our Denver machine shop to find us working with metals like Adamantium or Bombastium. In fact, it’s impossible for you to discover what we’re casting and prototyping with these kinds of metals because they actually don’t exist! While Protocast Inc. frequently works with real metal materials like stainless steel, zinc, magnesium, aluminum and other various alloys, we figured that we might as well enjoy today’s blog post and write about some fun fantasy metals that only exist due to pop culture and superhero stories. 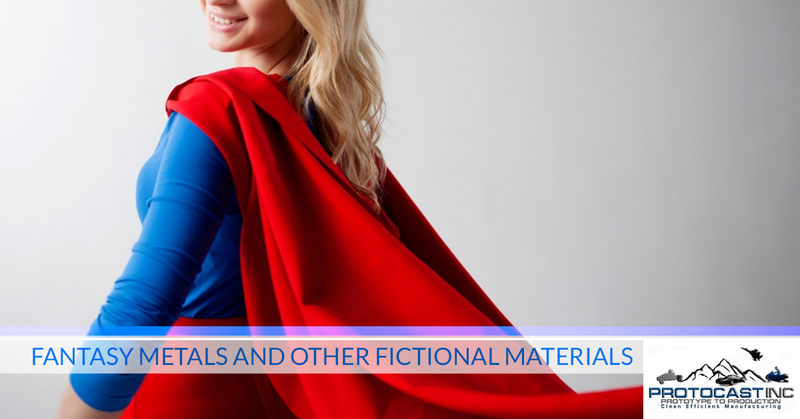 We must admit, although, that it would be pretty cool if some of these fictional resources did, in fact, exist. Despite the fact that you won’t find these types of metals and materials, in reality, Protocast Inc. does do incredible work with cast aluminum, sand casting, investment casting and other forms of real metal casting in the Denver area. To get an accurate prototype of your model before you put it in a full-scale production run, get in touch with the rapid investment casting professionals at Protocast Inc. today! In the real world, a metal is an element in the periodic table which belongs to one of certain groups or columns and has a specific type of crystal lattice with free electrons. In the fantasy world, however, a metal is a magical, shiny material with wonderful and inhuman properties like super strength, lightness, magic resistance and so on, often not resembling any of the metals found in the periodic table of elements. Fantasy metals are typically split into three different categories: ores, catalysts, and alloys. Now, the good stuff: let’s take a look at some popular examples of fantasy metals and fictional materials. Sometimes spelled as ‘orichalcon’ or ‘orichalc,’ this early fantasy metal originated way back before the Marvel or D.C. Comics days. Orichalcum actually first appeared in Plato’s version of popular, the Atlantis myth – you know, the one with the underwater city. The name ‘Orichalcum’ means ‘mountain copper’ in Greek, and name fittingly describes its color which appears as copper or bronze. The unique properties of Orichalcum range from source to source, as sometimes its schtick is strength, sometimes it is high value, sometimes it is magic resistance, and other times it is room-temperature superconductivity. Also, Orichalcum can sometimes float. What would Wolverine be without adamantium? It’s a fair question because Adamantium is best known as the substance bonded to Wolverine’s skeleton and iconic claws. (interestingly enough, adamantium is first presented as part of the character Ultron’s outer shell). As you may have known or could have guessed, the defining quality of adamantium lies in its practical indestructibility – this is what aluminum and titanium can only dream of becoming. Though of course a fictional metal alloy that appears in the Marvel Universe, Adamantium is not actually depicted as being a naturally occurring metal. Rather, Adamantium is described as having been inadvertently invented by the fictional American scientist and metallurgist Dr. Myron MacLain in an attempt to recreate his prior discovery, a unique alloy of steel and vibranium. Despite the superior strength and durability of this fictional metal alloy, Adamantium is rarely used due to its high cost and inability to be reshaped. You probably didn’t expect a fantasy element to come from a hilarious children’s cartoon, but Jerktonium is actually from a Christmas-themed episode of SpongeBob SquarePants. With the appearance of a lighter-colored version of Kryptonite, it acts as a solid material and is seen being inserted into fruitcakes for unaware characters to ingest. The sole effect that this fake element has is giving characters in the show a bad attitude when they come in contact with it, only to be in a sour mood until they are cured. Other side effects from consuming Jerktonium, besides becoming a jerk, include a fast growth of stubble (apparently the creators of the show had something against beards), a look of tiredness highlighted by bags under the eyelids, and an angry look illustrated by the character’s eyebrows. Don’t mistake this fictional element with Superman’s classic arch nemesis, Kryptonite – Feminum actually concerns the female superhero Wonder Woman. This metal, found solely on Paradise Island, is the indestructible metal (every fantasy metal just seems to be indestructible) of which Wonder Woman’s bracelets are made out of. Considering that Wonder Woman and other inhabitants of Paradise Island using their Feminum bracelets to deflect bullets, the need for an indestructible metal makes sense. We’ll admit that our Denver machine shop doesn’t cast with Adamantium or Mithril, but we do produce accurate metal prototypes that can help your company save countless dollars on pre-production costs. For diecast parts, aluminum casting, sand casting, investment casting and rapid investment casting services that outpace the competition, get in touch with Protocast Inc. today to get the most out of your production run.